Being part of a community involves responsibilities. Knowing the College’s expectations regarding student procedures and behaviours is important for all members of the community. Student procedures include the Student Code of Behaviour, consequences for inappropriate behaviour, uniform regulations, use of college resources and notification of absenteeism. Twice a year the girls are required to read through these expectations with their Home Room teachers so that they are reminded about the rights and responsibilities they have as members of the Mount Alvernia community. Knowing these procedures leaves the students with a clear knowledge of why consequences are sometimes needed to ensure that all the rights of all students are respected and evident in their behaviour. To provide opportunities for students to develop self-discipline and self-directed growth towards maturity. To ensure within the College the necessary conditions for effective teaching and learning. To encourage standards of behaviour (personal values, respect for others) that befit young Christian women. be given guidance, help, and support when required. Students must obey all reasonable instructions of staff. Students must behave in a way which is non-disruptive and safe. Students must not physically or verbally abuse others. Students must be in attendance throughout all classes and arrive punctually unless formally excused. Students must respect the property of the College and of other students. Students must obey the College uniform and dress code. The essential principles are SIMPLICITY and SAFETY. When in school uniform, students are representing Mount Alvernia College. At these times, their behaviour and the manner in which they wear their uniform should comply with general college regulations. While the College cannot always control the behaviour of students in public, those students in uniform who are unable to behave appropriately will be required to accept the consequences of such behaviour. Regulation day dress (should be knee-length or below) or pants and blouse, to be worn with tie. House, college, and name badges should also be worn. Black leather lace-up college shoes are to be worn, and laces must be tied. (Deck shoes, ‘ballet’ or strap shoes are not acceptable.) 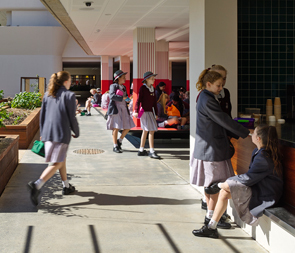 Plain white crew socks or Mount Alvernia crew socks are to be worn – plain white socks are to be of similar length to the Mount Alvernia socks (sport anklet socks are not acceptable). Pants and blouse to be worn with grey socks. Grey or skin-tone pantyhose may be worn with the dress. Leggings are not to be worn. The formal hat must be worn to and from school as part of the college uniform. Formal uniforms are to be worn to and from school every day. If students have a sport lesson during the day they are required to wear the formal uniform and change into the sport uniform at the break before the lesson and change back at the next break. The only reason students would be in sports uniform after school is if they are participating in after-school sport activities. Regulation sports uniform consists of Mount Alvernia grey shorts and Mount Alvernia maroon sports shirt. Sports shoes only should be worn. Skate/surf/volley/‘ballet’ and canvas types of shoes are NOT acceptable. White Mount Alvernia anklet socks or plain white anklet socks. Either Mount Alvernia bucket hat or Mount Alvernia sports cap. The official college tracksuit or hoodie can be worn during HPE or sport activities or when representing the College at sporting events. It can be worn with sports shirt and shorts. Regulation sports uniform Mount Alvernia grey shorts and Mount Alvernia maroon sports shirt must be worn unless provided with a sport-specific uniform by the Sports Coordinator (eg Open Team Uniform). If selected in the Mount Alvernia Swim, Athletics, or Cross Country Team, the Mount Alvernia swimming costume/athletic strip must be worn. White Mount Alvernia socks, plain white socks, or Mount Alvernia long socks (eg soccer/hockey) are to be worn. The official school tracksuit or hoodie can be worn when representing the College at sporting events. It can be worn with sports shorts. Mount Alvernia blazer with monogram is a distinct part of the winter uniform and compulsory for Terms 2 and 3, worn with regulation day dress or pants and blouse. Mount Alvernia regulation v-neck pullover (woollen or synthetic) is an optional extra with the regulation day dress. A white, black, grey, or maroon scarf may be worn in winter. A Mount Alvernia school bag with monogram is available from the College Uniform Shop. Non-regulation school bags are not allowed at any time. A specific sports bag is available for purchase if required to carry sports gear. School bags are not to be defaced with graffiti or in any other manner. A college-monogrammed bag must be used when students are in school uniform or representing the College. All articles are to be clearly marked with the owner’s name. Students with pierced ears may wear one pair of small, simple studs or sleepers, one in each lower ear lobe. Studs in noticeably different colours or shapes are inappropriate. No other jewellery, rings, necklaces, crucifixes, bracelets, studs, facial piercings, or ornaments are to be worn. Wristwatches are permitted. Students with inappropriate piercing/s or incorrect hair colour will not be allowed to return to the College until it is corrected. Hair must be tidy and appropriate to college uniform. Hair below collar length is to be neatly tied back (ribbons and scrunchies are available from the Uniform Shop). Students with inappropriate hairstyles – eg colours not in the natural range – will be required to change them. Only black, white, and/or maroon ribbons, small clear or brown clips or combs, or maroon, white, or black elastic hair ties may be worn. Plain black, white, and maroon headbands are also permitted. Make-up and nail polish are not to be worn. Natural beauty kits are available in all home rooms, with Pastoral Guardians, and at Student Reception. Students will be asked to remove offending makeup or nail polish immediately. If a re-offence occurs parents will be notified by the Home Room teacher. Hats must be worn at all times when students are outside in the college grounds and not in the shade. If the attire for an excursion is day uniform (with blazer in winter) then the formal hat should be worn. Students who turn up in sports uniform will not be permitted to attend. The excursion bag must be used. Sometimes students have a uniform misadventure while at, or on their way to school, eg periods coming unexpectedly, accidents with materials used in class, etc. Spare uniforms are available from the College Office which can be borrowed, washed, and returned in such circumstances. Students are to wear sport uniform with sport shorts and shoes to and from school. Face paint or body paint, if applied at school, must be removed before going home. No crepe streamers are permitted at any swimming pool. Students are to wear formal uniform unless otherwise informed. The jewellery is removed and placed in the small yellow envelope which is clearly marked with the date, student’s name and Home Room, the teacher’s name and then given to the Pastoral Guardian for safekeeping. If a first offence, the student may collect the jewellery at the end of the day from the Pastoral Guardian. For any repeated offence, the same procedure is to be followed but instead of the jewellery being collected by the student at the end of the day, a parent will be notified. Students will unpack at their assigned lockers before the 8.25 am bell and enter the classroom with their teachers at 8.30am. Valuables must be locked in lockers. No responsibility is taken for loss of valuables left in other places. Bags are to be put on the racks or in the lockers provided. They are not to be left on the ground as they become a hazard to staff and students. Books and school equipment only are to be taken into school rooms. All students are asked to take pride in seeing to the cleanliness and tidiness of all rooms. Cleanliness in the school grounds is the concern of all and students are responsible for keeping their areas tidy and using the bins provided. Chewing gum and bubble gum are not permitted anywhere in the school. Accidents are to be reported immediately to the supervising teacher and recorded in the Accident Book held by the Principal’s Executive Assistant. If a student is absent, parents/guardians are asked to telephone the College Absentee Line or Record a Student Absence on the website before 9.00am. A note, properly dated and signed by the parent/guardian, will be presented to the Home Room teacher on the student’s return to school to explain any absence. Once present, a student is not permitted to leave the College grounds without the permission of a member of the College Leadership Team. An SMS message will be sent to a student’s parent/guardian if they are absent from school without notification. SMS messages are sent from 10:15 am. When a student wishes to leave the College precincts during the day, she is to give a note from her parents/guardians to her Home Room teacher for signing. She is to see a member of the College Leadership Team who will also sign the note either before school or at morning tea. The student presents the note to the office staff before leaving the College. The time of leaving will be recorded and the absence marked in the official roll. Students must have their diary signed on the ‘Leave From Classroom’ page if they require permission to leave a classroom. If a student arrives at school after the official time for commencement of Home Room or classes, she must report to the office where her time of arrival will be noted. Unless the student is accompanied by a parent/carer into the office, she will present a note explaining the reason for being late. The student will receive a late pass stamp in her diary to present to the teacher of the class she will then enter. Ordinary medical and dental appointments should not occur during school time if possible. Appointments with the School Counsellors are confidential. This means that what is discussed during an appointment is not shared with anyone else – parents, friends, teachers, etc. unless an agreement is made between the Counsellor and student. If information shared with a Counsellor indicates that a student is in danger then the Counsellor legally must break confidentiality. If this needs to happen the student will be told and the process for passing information on will also be made clear by the Counsellor. A slip is available at the office for students to make an appointment. This will be filled in and placed in a box at the office at morning recess, lunch, before or after school only – NOT during class time. The Counsellor determines the date and time of student appointments and completes an appointment slip which is given to the students in Home Room time. The Counsellor then alerts the teacher whose class the student will be missing to attend the appointment. This allows the teacher to get back to the Counsellor if the appointment causes difficulties, eg because of an exam, excursion, etc. The student therefore does not have to show her appointment slip to the teacher but comes straight to the Counsellor at the beginning of the designated period. If this is in the middle of a class, the student would, of course, be expected to excuse herself before leaving. Students should not ask to leave class to see the Counsellor unless the above procedure has been followed. At no time will groups of students be sent from a class to see the Counsellor. If there is a problem with a group of students, another student will be sent to the office to get a member of the Leadership Team. Mount Alvernia is a BYOT college, ie students must bring their own laptops to support their learning whilst they are at school. The laptop must meet the minimum specifications as set out here. A short-term loan device may be available while a damaged laptop is being repaired. On arrival to class students must turn off their phone or electronic device. The use of a phone or electronic device within the classroom will be for educational purposes only. Using either item for personal use during class is not permitted at any time. Making or receiving calls at lunch times should only be done away from the company of others. Students should remove themselves from their group as necessary. Listening or using electronic devices outside of the classroom should not interfere with the socialisation of the group. Students are not permitted to use ear phones while walking within the school grounds. Failure to comply with the above will result in immediate confiscation of the phone or electronic device. The item will be placed in a named envelope and given to the Pastoral Guardian to be collected at the end of the day. Students who have their phones or electronic device confiscated more than once will need to hand it into the Pastoral Guardian each morning for a week. Since parents often rely on the mobile phone to contact their daughters after school, a confiscated phone will only be kept overnight if a student continues to use their phone or electronic device after repeated offences are noted. Use of technology that offends or affects the wellbeing of others will be considered as bullying and will be dealt with according to the Process for Dealing with Incidents of Bullying outlined in point 18 of the student diary. Students who receive inappropriate messages or phone calls are encouraged to inform a staff member or parent as soon as possible and keep a record of the transcript. There is a zero tolerance on cyber bullying and parents/guardians will be phoned immediately to consider the necessary action. Conduct when travelling reflects the student’s respect for herself and her degree of self control. It also has a bearing on the good name of the College and, ultimately, on every student’s reputation. On public transport, students should be courteous, quietly-spoken and seated where possible. If there are insufficient seats, students should always give up their seat for adults. They should not lean out of windows or doors. Any student leaving class because of sickness must inform her Subject Teacher and her diary signed on the ‘Leave from Classroom’ page before reporting to the office. If necessary, another student should accompany the sick student to the office and then return immediately to class. The office staff will record the necessary details. Permission must be obtained from the office before leaving the College to return home. The College will notify the girl’s parent/guardian who will make arrangements for the student to return home. If parents/guardians are not available the emergency number will be contacted. Students participating in the FCIP and Private Music Tuition Programme must have their diaries stamped with the Music Pass on the date of their lesson indicating the time when their music lesson will occur. This is stamped by their music tutor or the Curriculum Leader: Culture. The stamped pass in the diary must be presented to the subject teacher when leaving the class and again on returning to their next lesson. Some of the instrumental teachers are available only for a limited time each week and so lessons for students with these teachers will occur at similar times each week as there is only limited rotation possible. Music tutors will try to vary the lesson times to avoid the student missing the same class each week. Names of teachers where this occurs will be given to staff each year. It is always the responsibility of the student to make up work missed and parents are aware of this. However, the College is a joint sponsor of this programme and so teachers are asked to facilitate student participation by helping where possible with informing students of work missed. Students with music passes in order should not be refused permission to attend their lessons. When a student (other than a Year 12 completing her official studies) leaves Mount Alvernia, parents/guardians are to notify the Principal in writing. This will ensure that all necessary documentation will be completed. Assignments are assessable work completed during student’s own time, which may include class time. Tests are assessable work completed during class time or examination sessions. Early in each semester, students are issued with Student Guides which list all assessment in the subject. All assignment work must be submitted in class during a period previously indicated by the teacher. The teacher will ask each student to submit her work/assignment and initial the roll beside her name. Any unusual situation will be noted by the teacher. In all year levels, reasons for absence from tests, or the late submission of assignments must be carefully documented by parents and retained on file by the subject teacher. In Years 11 and 12, illness, which affects the completion of any summative assessment, requires the production of a medical certificate. Other extenuating circumstances must be explained in complete terms by parents/guardians to the subject teacher. If written documentation is required by more than one subject area, students may present this documentation to the Coordinator of Teaching and Learning (Years 11 and 12). Students must approach the teacher of the subject in which assessment has been missed, on the first day of return to school. The student must present documentation to the subject teacher. Names of students who have failed to complete assessment at any stage of the program will be passed to the relevant subject Curriculum Leader. Appropriate action will be taken and parents/carers will be notified. complete an extension form obtained from the Library. hand the completed form to her subject teacher together with evidence of work completed so far and other relevant documents (e.g. medical certificate). negotiate a “new due date” with her subject teacher if extension is approved. In all year levels, students must submit drafts via Turn-it-in for teacher feedback to verify authenticity of ownership. As students progress from Year 8 to 12, the level of feedback will be scaled back to promote the independent completion of tasks. For Year 11 and 12 specifically, authentication of prepared tasks will be required by the teacher and documentation of this may need to be submitted at Panel review time. Research notes and bibliographical details should be kept by the student and submitted if required. All resources should be acknowledged in student work. The teacher may ask students to further demonstrate their understanding of the contents of the response. submit one full draft to be read by the teacher but this will not be closely corrected. Formal examination blocks will generally be held in Year 11 and 12 subjects at the end of each Semester. Other exams and tests will be held at the discretion of the relevant Curriculum Leader or Subject teacher. Reports are issued at the end of each semester. There are no special arrangements for students leaving early for holidays to do examinations outside the programmed time. The term homework refers to both set homework, including such things as problems, assignments, practical work and preparation for oral presentations, plus study. The term ‘study’ includes set learning, reading or revision, as well as extra learning or tasks undertaken by the student on her own initiative. If students are spending significantly more time than this in order to complete set homework, they should consult with their teachers. Every report of an incident of bullying behaviour is to be treated as a serious issue. The following are the procedures to be followed when a complaint is made. those accused of the bullying behaviour to inform them of the accusation, give them the opportunity to respond and to issue a warning that a repeat offence directed at the current or other victims will lead to the steps outlined in (d) – (f). The Pastoral Guardian may facilitate a face-to-face meeting between the parties if it is judged that such a meeting would be productive and not escalate the situation. The victim(s) / perpetrator(s) may be referred for counselling. A second documented offence will result in the parents/guardians of the bully being required to attend an interview with the accused student. At this meeting, the student will be warned that a third offence may result in suspension of up to three days. A third offence will normally result in a period of suspension unless there are other circumstances which make this action inappropriate. A fourth offence may lead to the student permanently excluding herself from the Mount Alvernia community. All records of bullying offences will be kept in the file of students involved in the bullying. All malicious or false accusations will be treated as incidents of bullying in themselves and the above processes applied. Students who go to the Information Services Centre without a teacher need to sign in and sign out at the Circulation Desk, for Workplace Health and Safety reasons. Students are issued with Book Hire Texts and they are responsible for keeping them in good condition throughout the year. Students who go to the Information Services Centre without a teacher need to sign on at the Circulation Desk, for Workplace Health and Safety reasons.